Vea lo más destacado del Valle Sagrado de los Incas en un día en una excursión sin estrés desde Cusco. Disfrute de un paseo panorámico por el campo peruano con vistas panorámicas de los Andes nevados y explore los sitios arqueológicos incas y los mercados tradicionales en los pueblos de Pisac, Ollantaytambo y Chinchero. Se incluye una parada para almorzar en Urubamba (por cuenta propia) y recogida y entrega en el hotel. 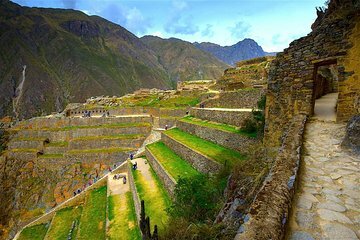 Visita los sitios arqueológicos incas y los mercados tradicionales. Su tour en grupos pequeños asegura una experiencia personalizada. Transporte de ida y vuelta desde selectos hoteles de Cusco incluidos. Once you are picked up from your hotel, your journey to the sacred valley begins with a scenic route to Pisaq. You will see how they make the different colors of dye made for wool to make sweaters etc. Also the different types of corn and potatoes. Sacred Valley was just breathless, literally as there is a hike to the top of the ruins. You could also just relax and enjoy the view on any one of the green terraces if you prefer not to hike up the ruins. We also saw how jewelry was made in the Pisaq market, and how they made empanadas from a traditional oven. You must try them, they're delicious and fresh. Different varieties to pick from and they are made differently from the Mexican / Hispanic ones that you may have had other than in South America. We also had time to browse the marketplace and they even had a woman selling Inca corn on the cob. They are really big and filling, so good with some sprinkling of parmesan cheese as it's sold hot right out of the cooking pot! Only $1 American money. The tour comes with a buffet lunch in the town of Urubamba, for some reason I was separated from my tour group and had lunch alone at one restaurant while the others went to a different restaurant. Not sure if it's because I was allergic to shellfish. BUT, even if they did have shellfish dishes, I could always not eat it and have something else...after all, it's a buffet. After lunch, onward to some more scenic views, even the Andes with a snow cap. Tour took about 10 and a half hours but worth it!! I had a wonderful time on this tour and would recommend you book it. Our tour guide Rolando (?) was great! He was very informative throughout the entire tour. I didn't want the tour / day to end, it was fantastic!! !